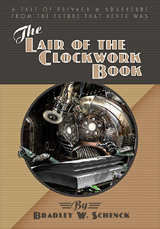 Until the end of July you can buy the eBook edition of The Lair of the Clockwork Book for just $1.45, only at Radio Planet Books. That’s less than half the usual price of $3.99. 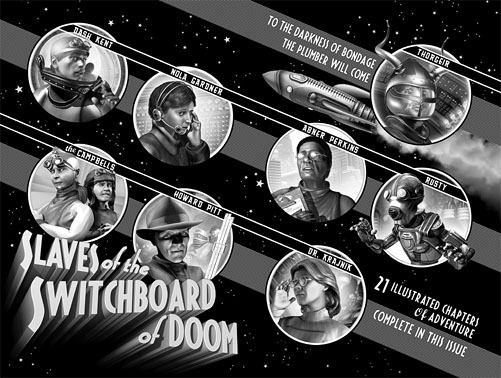 It’s been five years since I started working on Slaves of the Switchboard of Doom. Even though a lot of that time was spent not working on the book it’s been a great pleasure to see it out in the wild at last. And I’ve done some guest posts and interviews at blogs, not all of which are live as I write. 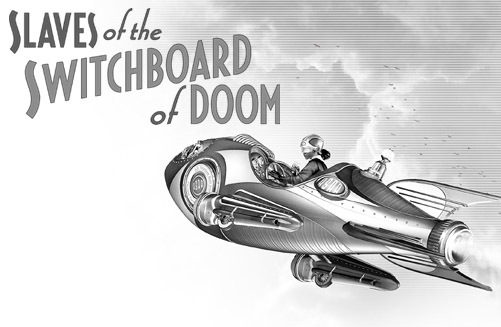 But we’re closing in on the end of the book’s launch week. It’s time to round up this coverage and pack it up for you into a single, easily digestible package. There are three raisins in every paragraph! 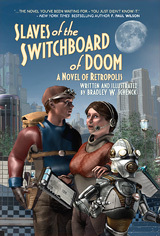 Luxuriating in a retro sensibility that evokes the Art Deco designs of classic SF like Metropolis and old Buck Rogers serials, Schenck combines his iconic artwork with a rousingly old-school adventure set in the city of Retropolis, filled with pneumatic tubes and flying cars, rayguns and not-so-giant robots. Lawrence M. Schoen (of Barsk:The Elephants’ Graveyard) decided that instead of questioning me about my book, he’d ask me to tell him about my most memorable meal. This was a terrible, terrible mistake. For the Tor/Forge blog I revealed horrifying secrets about my hair and issued some timely warnings in The Truth About Mad Science. Paul Semel, on the other hand, was far more sensible. 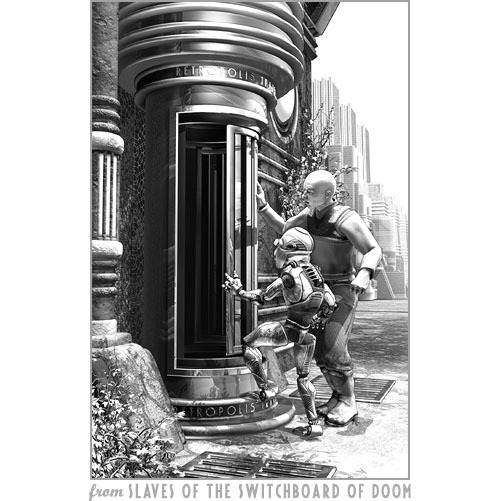 He asked me a bunch of questions about Slaves of the Switchboard of Doom and I managed to sound pretty smart, the way you do when you have days to compose your answers. Soon after I posted this, Fantasy Literature published my guest post The Accidental Novel, and Other Surprises. It sort of explains my writing process. Bonus! They’re giving away a copy of the book, plus a mug from Retropolis. And then there’s this interview at The Quillery, where I answer some of The Usual Questions and do my best to sound smart again. Juggling so many narrative threads is difficult work that can easily go awry, but Schenck holds them all together, creating a high-energy, ridiculously fun read from start to finish. If you’ve read reviews of books after you’ve read the books themselves, you’ll have noticed that readers always bring something to the table. Now and then they seem to have read a completely different book from the one you remember. And that’s the way it should be. No book is complete until a reader reads it. Still, you can be surprised by the book a reviewer read; sometimes it sounds like a completely different book. Happily I haven’t seen much of that yet. And although Avalinah of Avalinah’s Books hates my cover with the white-hot fury of a thousand suns, she loves, loves, loves everything else about the book. … and Your Reviews, Please! People often wonder what they can do to help a creator whose work they like. And the answer is twofold. And second, talk about how much you liked it, and why. I mean, if you liked it, there’s a pretty good chance that some people you know will like it too. And in these days of social media that means posting and tweeting about it, saying why you enjoyed it. Is this threefold? I think we’re still in the second fold. Post reviews at retailer sites. This is important first because those reviews influence customers. But just as important is the fact that the software behind the scene is watching the number of reviews a book or other product has. Lots of reviews? This is a thing that many people are interested in. Therefore, promote the thing. At Amazon (and probably elsewhere) promoting the thing makes it appear in recommendations, in “Customers who bought this also bought…” lists, and on the prominent pages of the site. Promoting the thing promotes the thing. 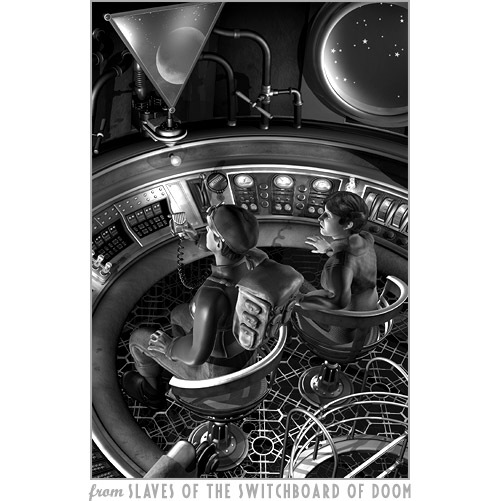 So if you’ve read and enjoyed Slaves of the Switchboard of Doom, please review it so that other readers can find out about it. Review it; post, tweet, and share it. Promote the thing.